The sky is falling! The sky is falling! Or to put the precipitous decline of the PC industry more aptly, it appears as though the bottom is finally falling out. After a devastating first quarter saw all major PC manufacturers (except Lenovo) post losses in double-digit percentages, the analysts at IDC recently revised their forecasts to predict a whopping 7.8 percent decline in PC shipments this year. That’s a Very Bad Thing by all accounts—especially since last year’s 4 percent decline already had the PC industry reeling. Here’s the thing, though: All of those forecasts are dead wrong. Chicken Little, the sky ain’t falling. In fact, consumer hunger for PCs has never been stronger, as long as you adjust for what what you might call an accounting error. A rose by any another name is still a rose. And tablets—the very tormentors causing the old PC guard such intense pain—are truly PCs, despite fevered claims to the contrary. Calm down there, bub. Put down that torch and pitchfork. I’m as diehard a PC guy as diehard PC guys come. I just built a new desktop from scratch, spending an inordinate amount of time fussing with my cable management. I’ve messed around with case modding. Overclocking? Been there, done that. (Overclocking RAM isn’t worth the hassle, by the way.) Heck, I even puzzled out how to eliminate the modern UI from Windows 8 because, well, you’ll pry the desktop from my cold, dead hands. Is the Raspberry Pi a PC? 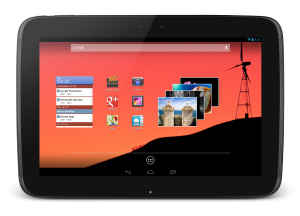 Like slates, it has an ARM processor, albeit one whose performance can't hold a candle to that of a modern tablet. So, yeah, I love PCs—but my computers extend beyond my desktop. Next to my hulking quad-core tower sits a small stack of laptops. One’s a Windows 8 hybrid. Next to them is my Raspberry Pi. Next to that sits my Nexus 7, silently beckoning me to open my Pocket, Pulse, and Netflix apps. I also have an old Windows XP slate computer tablet thingie, which works absolutely horribly thanks to its diminutive display. And I’d love to add one of these monstrous bad boys to the mix. And what about cutting-edge Perceptive Pixel displays? Or PCs operated by voice control or Leap Motion, or the crazy machinations being dreamed up by the mad scientists at Microsoft Research? You see where I’m going here. Form is not function. This may sound like sacrilege in the precincts of PCWorld, but I’ve always considered tablets to be more an evolved form of PC than a whole new beast. And don’t give me that “But they’re glorified phones!” nonsense either. Indeed, slates can already handle most casual computing chores—from basic productivity tasks to Web browsing to media streaming and beyond—with aplomb. That goes double if you slap on a Bluetooth keyboard or one of Microsoft’s fancy Surface Touch Covers. No, tablets can’t handle everything that desktop PCs excel at, but laptops and netbooks don’t do it all, either. The Nexus 10, with its better-than-Retina display and beefy dual-core Cortex-A15 processor, blows through everyday tasks without breaking a sweat. Even if you’re on the fence about whether Android- and Apple-based tablets are honest-to-goodness computers, we now have those pesky Windows tablets mucking things up further. 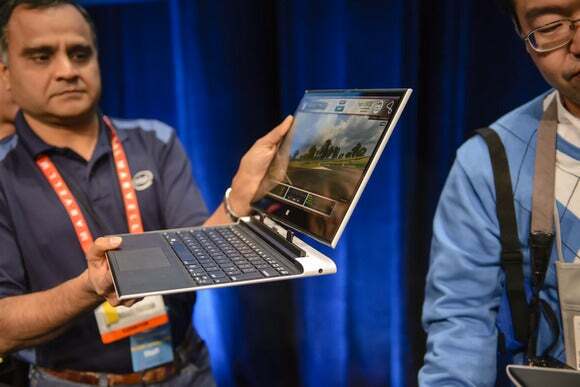 A Windows 8 tablet powered by an Intel or AMD processor can perform any software-based task a full-blown computer can, though the experience may be more akin to using a netbook than to using an octa-core gaming rig. PCWorld’s lab testing of Clover Trail-based slates like Samsung’s ATIV Smart PC shows similar results. Web browsing, basic document editing, and similarly lightweight tasks hold up just fine. High-definition video plays without a hitch, though multitasking slows things to a crawl and performance in any demanding application (such as photo editing) is abysmal. Will tablets fit everyone’s needs? Of course not. Neither do laptops. But there’s no denying that today’s tablets are perfectly capable personal computers, if not quite perfectly capable professional computers. Need more persuading? Check out usage habits. That used to mean Windows laptops. Now it means tablets (and increasingly, Chromebooks). And is it any wonder why, when the user experience that a $200 slate delivers shines in comparison to the frustrations inherent in a $200 laptop, assuming you can even find a $200 laptop? Also, witness what’s happening in the borderlands, where tablets and laptops collide. Synergy, mashup, amalgamation, convergence, whatever you want to call it, it’s happening. In fact, hybrids and convertibles may just be the magic bullet for Windows tablets. Intel's reference design for Haswell-powered Windows hybrids: Tablet or computer? Both, because tablets are PCs too. 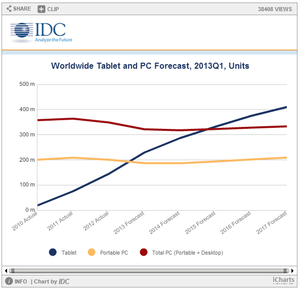 Technological advances are about to make the already cloudy distinction between “tablet” and “PC” even murkier. Mobile processors in the pipeline from AMD and Intel promise laptop-esque power in near-true tablet form factors, reducing the compromises found in first-gen Windows hybrids. One day, we’ll look back, laugh, and wonder how tablets were ever considered anything but personal computers. And on that day, we’ll realize how silly all of today’s worrying about the future of the PC really was. Sure, laptop and desktop sales are dropping—but tablet sales are skyrocketing, and tablets are PCs too. 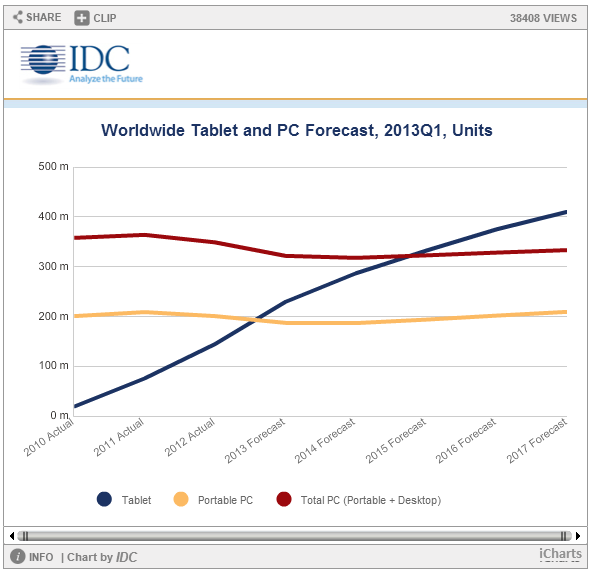 By IDC’s count, tablets and so-called traditional PCs are expected to sell a combined 743 million units. That’s a whole lot of computers. Desktops and laptops alone topped out at 363 million in 2011. Change is never easy. Remember what the shift to laptops did to desktop titans like Gateway and Compaq, for example, and compare that to the woes that Windows and Microsoft’s manufacturing cohorts are experiencing now. Giants are likely to fall. But take heart, even in the midst of all this strife. Tablets are rising, but the PCs you know and love aren’t going to disappear any time soon. We’re witnessing an evolution, not a revolution—and demand for computers of all shapes and sizes has never been more insatiable.